A baseball game often goes on regardless of the weather. Thunderstorms and torrential downpours are enough to delay, cancel or postpone a baseball game. However, most baseball games continue in the presence of light rain. As a result, the glove you worked hard to break in may get wet. A wet glove can lose its shape and become stiff. Fortunately, playing baseball on a rainy day or accidentally leaving your glove outside does not mean the end of your glove. Proper drying and conditioning can restore your glove to its former glory. Dry the outside and inside of your glove with a clean, dry towel. Pat as much moisture as possible out of your glove. Use multiple towels, if necessary. Place your glove in an open, dry indoor location out of sunlight or a heat source. Check the lining periodically to monitor progress. Apply a glove softener to the leather after your glove is dry. Use a quarter-size amount of softener, or follow product instructions. Rub the glove softener into the glove using a clean, dry towel. Allow the glove to dry for 24 hours. This will soften the leather and prevent your glove from becoming stiff. Maintain the shape of your glove by placing a baseball in the pocket. 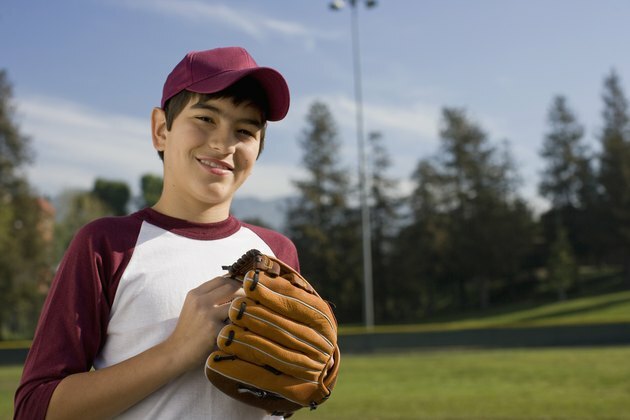 Squeeze the glove shut and stretch a rubber band around the glove to secure the baseball. Store your glove in a cool, dry location. Do not use any form of heat -- including a hair dryer -- to remove moisture from your glove. Excessive heat can harden and crack the leather.